Is chalk paint taking over your Pinterest feed and sneaking into your dreams at night? I know the feeling. It seems like every picture I click on in my feed is another example of gorgeous chalk paint. 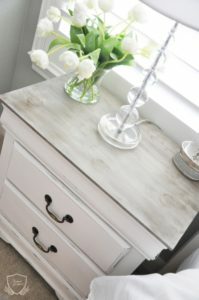 Chalk paint has become so popular because of it’s unique qualities. Chalk paint’s best quality is the fact that there is no primer needed. The limestone in chalk give this paint an ability to grab at any surface, wood, laminate, plastic, etc. 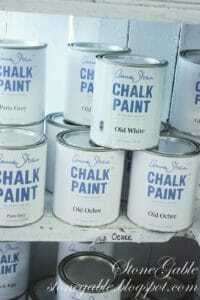 So repainting DIY home owners love the easy of just grabbing chalk paint. Chalkpaint also has a matte finish. Interior decor designers have traded shiny in for flat. The unique chalky- finish is very flat and will not shine at all. Some people love this paint finish, others hate it. It really is up to personal taste. I absolutely love the look and think it creates stunning furniture. 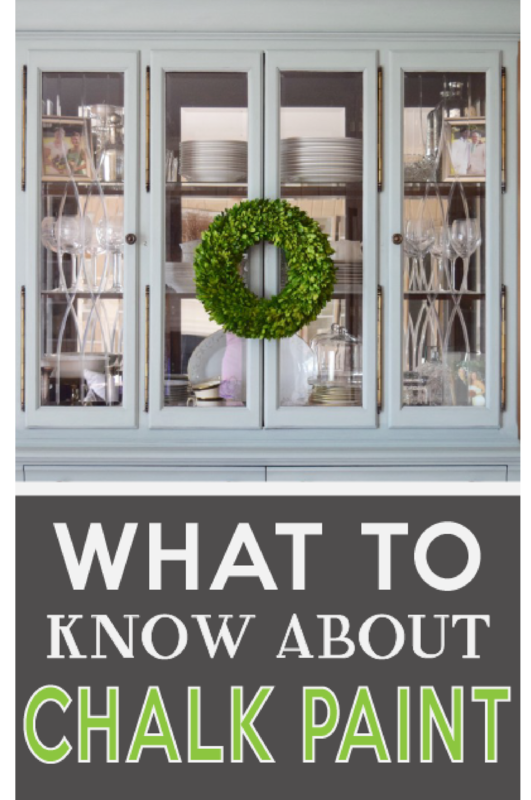 However, before you start covering every surface in sight, there are a few important things to know before painting with chalk paint. #5- It’s not fast, but is simple. Creating a beautiful piece of furniture with chalk paint requires several stages. There is painting, sealing, waxing, and buffing involved, which need drying time. Chalk paint can be applied to any surface, so skip priming! Be sure you have plenty of time and patience. Rome wasn’t built in a day and neither is stunning furniture. Some of the best refinished pieces are those found in attic, garages, or antique stores. Unfortunately, these type of old pieces are also covered in decades of dust and dirt. Chalk paint doesn’t require sanding or priming, (although I still do both of these thing) the surface needs to be as clean as possible. This means using plenty of soap, warm water, and a good scrub brush. After cleaning, you’ll need to let the piece dry completely, which may take a couple of days. #2- You’ll need two coats, maybe three. The miracle of chalk paint is that it is forgiving, and as it dries, brush strokes literally disappear. This gives you that smooth, matte, professional finish. However, you will most definitely need two coats of paint. This is usually sufficient, unless you have a dark spot you’re trying to cover up when you might need three coats. Don’t go overboard, more coats will not help the situation. When working with latex paint, a polyurethane clear coat is optional. It’s nice, but not required and most people skip it. 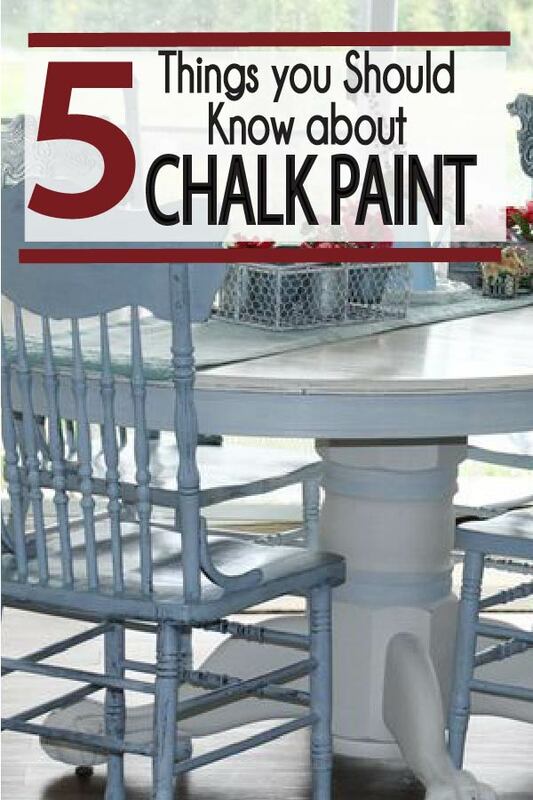 With chalk paint, you don’t want to skip the top coat step. There are two top coats you can use, wax or a polyurethane top coat. If you are painting a side table, dressers then a wax coating seals the paint enough. Wax also enhances the color, and prevents chipping and peeling later. It comes out like Crisco and you massage it into the wood like you would grease a cookie sheet. Reapply the wax a few time a year to protect your piece. If you are painting high traffic items like a kitchen table, or cabinets the wax will not be sufficient. You need to add a lacquer or poly top coat. Give it 2-3 thin coats. Chalk paint doesn’t have to be intimidating. A lot of people think it is harder and more difficult to work with than latex paint, but I actually think it is easier in several aspects. Plus, I love the results, and you simply can’t duplicate the look with plain old paint. if you know what to expect going in, the process is relatively easy and creates beautiful, seamless results that you won’t get anywhere else. If you have any questions or comments, leave them below and I will get back to you! Love this article? Pin it to remember it! Will the poly leave brush strokes over the chalk paint? Do you have any suggestions to prevent the brush strokes in that final step? Chalk paint leaves brushstrokes on purpose. If you really want a smooth look, use acrylic paint. However, I do sand my chalk paint after each painted layer, then I do my poly coat, sand it down- then do one final poly coat, and leave it alone. I am very lightly sanding these layers with a 320+ grit, really it is a light dusting to remove some of the brush strokes. Again, if you want no brush strokes, use acrylic or latex paint. No brush strokes when using a sealer called Polycrylic from Home Depot! Also would you recommend your favourite Purdy brush for chalk paint? Yes it works great with latex or chalk paint! 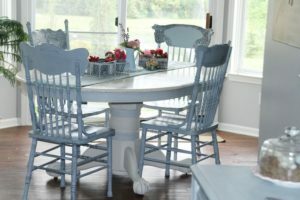 I bought Annie Sloan’s old white and Paris grey for our kitchen table and chair project. We are planning to use our existing Minwax water based polyurethane in satin finish as the top coat. But our local Annie Sloan vendor said the polyurethane will yellow the old white. Is this true based on your experience? Ginger, this is not true, with my experience. If you want to have something painted white and not yellow you need to avoid oils. Oil paint, and oil based top coats. Your polyurethane is perfect for white paints because it is one of the fewest water-based top coats. Your paint, if it is chalk paint, water-based should be fine as well. You can always paint the underside of your table first to double check. 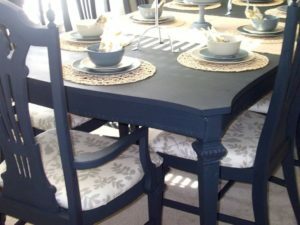 I have used chalk paint with NO yellowing problems. I have also used white latex paint with great success. Hi, so im about to start painting my dining table and chairs, i bought chalked paint, but now im confuse, because i bought the polyurethan water based top coat. So im not suppose to top it off with that? Its only wax? And after i wax it i can do the polyurethan? Once you wax a piece, you can not add any top coat, it will just bead up and not adhere. For your project, You are right, use your polyurethane top coat. Good luck on your kitchen table! Thank you. Is lacquer the same as polyurethane or poly acrylic? They all refer to the final clear top coat. Polyurethane is a top coat that comes in oil or water based. Poly acrylic is a term specifically for water polyurethane. Lacquer is a thicker, high gloss finish that is more durable, and requires a specific application (spray on). I personally use Poly acrylic, on most of my items, because it dries faster than oil based top coats, and is easy to apply. I want to chalk paint my kitchen cabinets. Will the chalk paint adhere to the boxes that are not real wood, particle board with some type of wood look film? Also, I have seen comments on other blogs about the wax not being good in the kitchen. Have you had any experience with that? Yes, the chalk paint will work on most surfaces. Particle board will work. If you are using chalk paint in a high traffic area such as kitchens, you need to give it 2-3 top coats of lacquer. You are correct in thinking wax will not be enough. Good luck! Thank you Miriam, good luck on your dresser project! I love this idea! I’m going to do some furniture that was my husband’s grandmothers. I’m a little confused about when to apply the polyurethane & the wax. I thought you could just wax over the chalk paint & that would it. I appreciate your help on this. ? Chalk paint is great because it only requires wax as a finish. Wax will seal in the paint, and protect it from chipping. It doesn’t stink and isn’t as messy as polyurethane. Polyurethane is only for latex paint, not chalk paint. Good luck on your painting job, I simply love old furniture projects! Super variety, black and gray furniture look really good.